Full disclosure: I am not a billiard player. I can’t play well but I think I could if I would put my mind to it. It is like with anything, practice will help to get better. 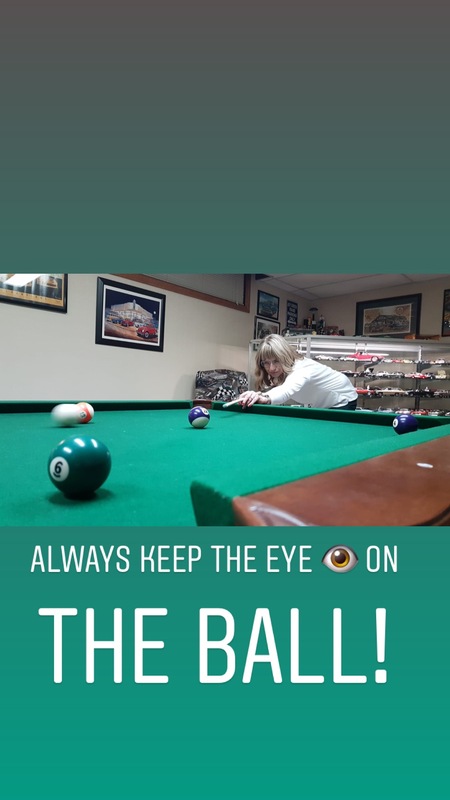 I played a game with my husband and even though he sunk one billiard ball after the next, I stayed calm and kept playing to the best of my ability. There were times when I didn’t aim well and the ball went off into a completely different direction. Bummer. Isn’t this how life can be as well? We want to do something or we want to have something but we don’t really pay attention if our actions help us to get where we want to be. I am a very goal-oriented person but unfortunately I have to work really hard on staying focused. I think our fast paced work environments don’t help. Our cell phones make us easily available and everyone seems to expect an answer right away. That’s why people often run around like chicken with their head cut off. What are we doing to ourselves? Did you know that, according to a 2015 study from Microsoft, the average person has an eight second attention span (less than a goldfish)? I choose 1 thing that I would like to complete today and prepare my mind with positive self-talk – I tell myself that I have successfully completed projects like this in the past and I visualize and get excited about the end result. I make sure my work environment feels right – right room temperature (if you cannot regulate the temperature have different layers of clothes) and I use essential oils to increase my focus. The best ones for focus are peppermint, lavender, rosemary and lemon. I have stopped multitasking – for me it’s better to give one thing my undivided attention and get it done – than do 10 things at the same time and get nothing done (I have been there before). I set short timelines throughout the day and allow myself short breaks – I am not a smoker but also non-smokers deserve a mental break. This is actually super important. If I feel stuck, I go for a short walk to reflect and refocus. It is definitely a challenge to stay focused in an over-stimulated world but we have to find a way that works for us or it will affect our mental and physical health in the long run.